The Severe's natural habitat runs from eastern Panama in Central America south to Bolivia and Brazil. Severe Macaws are a mini macaw, like the Hahn's Macaw. They are predominantly green with patches of red and blue on the underside of the wings. Their chest feathers are tipped with a bit of chestnut brown, which is where their alternate common name is derived from. 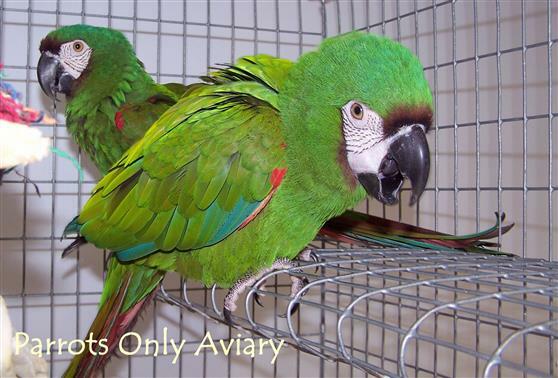 The Severe Macaw is a social and friendly mini macaw, and a great choice if you want a smaller macaw. These mini macaws are intelligent and eager for attention and play. They have a good disposition and respond well to handling and training. But they are a typical macaw and can be cranky at times and may prefer only one person or only one gender. Severe Macaws are entertaining and quick learners, they can be taught tricks which they will love performing but they can be noisy. They are very lively birds and will need lots of toys to keep them busy. Approximately 40+ years, depending on nutrition and care.